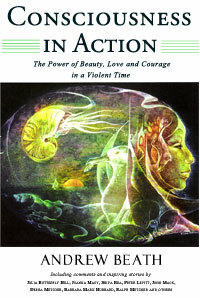 This article is an excerpt from Consciousness In Action by Andrew Beath (Lantern Press, 2005). About twelve thousand years ago at the start of the Neolithic period we humans began to modify our lifestyle from that of roaming hunter-gatherers to that of agricultural village people. In this article John Seed provides insights that address our relationship to the Earth from the perspective of evolutionary biology. John takes our family tree back into time’s recesses to include our primate relatives who evolved from early mammals living during the dinosaur epochs. We have all grown up with images of dinosaurs and their extinction. They disappeared approximately 65 million years ago, yet still exist in our psyches in mythological scale. This grand-dying-out marks the end of one geologic period and the beginning of another that scientists refer to as the Cenozoic. At the time of the meteor event that caused the dinosaurs’ extinction the largest mammals were no larger than today’s house pets. One particular species of the mammals that survived became the primate species that is literally our fore-parent. To contemplate this is mind-boggling, but it is a way into our connection to early life forms. It is also helpful in providing an expanded viewpoint for my discussions with John that lead to his following story. John is one of the most committed rainforest activists in the world today. We discussed methods to understand the current crises and put them into appropriate perspective. During the conversation he wove a story that goes back billions of years to a time when the Earth’s atmosphere had almost no oxygen. It is a transpersonal backward reach in time encompassing our inherited development made possible by the common heritage of our DNA. To put this in geological perspective, our earth has existed for about four and a half billion years. We have life’s first fossil evidence, which is of blue-green algae, from three and a half billion years ago, and life is assumed to have begun several hundred million years earlier. The first cells with a nucleus appeared a little more than two billion years ago. It was the emergence of these cellular forms that provided the building blocks for more complex life on Earth. It is this unbroken line of early species stretching back into the far reaches of time and our imagination that evolved into us humans. These beings are our actual ancestors. There is a process for extending our sense of being far beyond the tiny self that we’ve been taught to identify with by our culture. It’s a fictitious self because it disregards the air and water and soil out of which we are made and on which we depend. As soon as we separate from the fabric with which our lives are woven then any sense of who we are that remains is mostly artificial. Our authentic Self has roots that are nourished directly by the Earth and extend out through space and time. What has been particularly useful for me recently has been to steep myself in the best understanding that I have of the epic version of the story of our evolution – of how we each came to be here. I remind myself that it was I who crawled from the sea 400 million years ago and began to colonize the land. It was I who survived the ice ages. Of course all of us can say this. It wasn’t my personal "I"; it was the flame that was passed from generation to generation accumulating the experiences of each successive generation. Now I’m entrusted with this flame, and with the flame comes its entire history. This history includes not only the four billion years of life on Earth but also the eight or ten billion preceding years in which matter evolved, the galaxies evolved and the supernovas flared forth creating the elements that would be the basis for the present epoch. Something that I’ve found useful is to explore the nature of extinction. As a rainforest activist I’m aware that of the hundred or so species that we believe are disappearing from the Earth every single day, probably more than half of this holocaust is taking place within the rainforests. So I’ve certainly been painfully aware of the current extinction spasm. And it has been dawning on me over the last twenty years that we are in the middle of an event of the magnitude of what took place when the dinosaurs were extinguished. But I hadn’t really followed that train of thought until recently when I began studying the nature of what happened to the dinosaurs. Approximately sixty-five million years ago, a meteor six miles in diameter crashed into the ocean near the Yucatan peninsula, creating clouds of dust. Smoke and water vapor blotted out the sun and drastically reduced the temperature. As an immediate result of this event, fifty percent of all of the species that had been on the Earth died out, including everything large. It’s speculated that no animal larger than a cat was able to survive. One of the interesting things about that, which also seems to be true about the previous extinction events, is what it says about the survival of the fittest. It seems that all bets are off during such extraordinary times. The survival of the fittest seems to apply only during the epochs that separate such extinction events. The meek may not always inherit the Earth but in particular times of emergency, like these, indeed they do. When that meteor collided with Earth, those huge creatures that had been the fittest and strongest, who could take what they wanted, and had grown used to having plenty, were unable to survive in a time of scarcity. Those creatures that had been marginalized and had to learn how to make do – those that had been hiding in holes in the ground in fear of the successful, dominant creatures above – now it became their turn. Going back to the last extinction spasm before the dinosaurs at the end of the Permian period 251 million years ago, not only species but also whole families of species – like the Trilobites – disappeared. It is now estimated that ninety-four percent of the species that had existed until then were wiped out. Everything alive today radiated forth from the six percent that survived. According to Edward O. Wilson, a leading advocate of global conservation and University Professor at Harvard, the period of perhaps five to ten million years following each of these extinction spasms is a period of incredible experimentation, novelty and creativity because many ecological niches are empty, which allows the next epoch to begin. This understanding gives me a sense of hope because I had honestly felt sometimes that life, itself, was threatened by the extinction spasm that we’ve launched. As I learn about the tenacious bacteria that are eating away the fuel rods in the nuclear reactors and those that exist in airplane jet engines, I realize that life has this tremendous resiliency. Of course, human beings, mammals and such may well be in trouble. But I’m heartened by my kinship with the entire story rather than just the present chapter. And this has given me a tremendous refuge where I can retreat and re-gather my strength – especially after suffering losses in the campaigns that we engage in. There are far more losses than there are victories. For every forest we save, a hundred disappear. But particularly at those times when we see the destruction continue unabated, it is important to remember that whatever happens now, there will be a sequel. This epoch will end in extinction of some species, as have all previous ages; but it will merely be clearing the stage for the next magnificent chapter in the story of Life. And the very things that threaten us today may become the mainstay of Life in the future. Perhaps the first of these extinction spasms took place when photosynthesis began on the Earth. Previously, there had been a rich chemical soup and the bacteria – which were the first life forms – would live from these chemicals. Eventually, the bacteria had proliferated to the extent that all of the free chemicals had been used up and a time of scarcity began. Then some of these bacteria evolved the ability to capture photons of light from the sun. They used this energy to split the tough chemical bonds between carbon and oxygen in the plentiful carbon dioxide (CO2), and between hydrogen and oxygen in water (H20), which was also plentiful. They consumed the carbon and hydrogen and were able to grow and reproduce. And each time they did this, atoms of oxygen were released. At first, this oxygen oxidized everything in sight. All of the great iron bands – thousands and thousands of feet thick in the geological record – show the tremendous amounts of oxidation that took place. Eventually everything that could be oxidized had been. Then the oxygen began accumulating in the atmosphere and poisoning the bacteria that were around at that time. Most of the species of bacteria were unable to adapt to the situation and so disappeared, except where they still exist in compost heaps, in swamps, etc. In these locations anaerobic bacteria are still with us. But their period of dominating Earth had ended. The time of the aerobic bacteria started then – those that could survive while exposed to the air – from which we are descended. Similarly, the things that are the pollution crises in this epoch could easily become the food and drink of the beings of the future. When I first had this vision, I was afraid that it would erode my commitment to conservation. I thought that only hysterical fear of oblivion and utter despair could motivate me. If it was true that extinction spasms merely clear the stage for the next big show, then perhaps there is no need to save anything? So I was concerned that maybe all the enthusiasm for my conservation work would evaporate! After all, if we’re going to be followed by equally diverse and magnificent life forms that will have their million years – or hundreds of million years – in the sun, what does it matter what happens now? So I thought perhaps this awareness would lead me to a place where I was no longer interested in the path that I had been following for a quarter of a century in the conservation of nature. What happened, instead, was that I discovered my motivation for activism includes honoring my own incarnation and epoch. Although this Cenozoic Era is only one tiny aspect of life, and life itself is clearly not threatened, nonetheless I’m here as an expression of life. And I have tremendous loyalty to mammals, human beings and the natural environment that we depend on to survive and thrive. I also have nothing more meaningful to do than to struggle on behalf of life, as we know it today. But what this vision did do for me is to provide a tremendous sense of relief and comfort – and a relative detachment from the fruits of our struggles. I’m much better able now to cope with all the losses. At the moment, only a small proportion of the species of the Cenozoic (the 65-million-year geologic period since the dinosaurs) have disappeared. But the rate of extinction has accelerated rapidly over the last hundred years. And with the loss of habitat – which is the contiguous wild nature that is needed for different species to survive – the writing is clearly on the wall. A recent, extensive poll of biologists found that three quarters of those interviewed believe that half of the species will be lost within a century. A large but unknown percentage of that loss seems to be inevitable. Even if humanity awakened today and put aside its destructive competition for financial wealth and political power, many of the species that now exist would still be among the living dead. Because of the human population explosion and what we have done to the Earth, they no longer have any future – regardless of anything that could happen to reverse this trend. What is not yet known is whether human beings are also on the list of coming extinctions.